Former Governor of Bangladesh Bank Dr. Atiur Rahman has urges the south Asians nations to work towards easing regional tensions and enhancing connectivity for bolstering mutual economic prosperity. 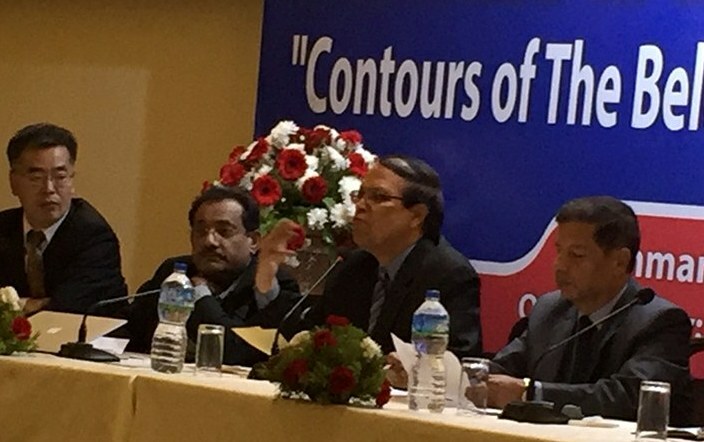 The professor of Dhaka University came up with the call while chairing a thematic session on ‘Contours of Belt and Road Initiative for South Asia’ at Kathmandu on Monday organized by Nepal China Friendship Forum (NCFF). “Importance of Asia as a hub of global economic growth has been increasing at an unprecedented pace during the last decade. Consequently economic cooperation and connectivity within the region and the sub-regions have become critically important. But political tensions within the region and sub-regions are major challenges against such cooperation and connectivity. We must work hard together and remain prudent in overcoming such challenges for greater public good in the region”, Atiur Rahman said. Former Foreign Minister of Nepal Mr. Mahendra Bahadur Pandey opened the event as the Chief Guest. Experts from India, China and Pakistan participated as panelists. They included Dr. Shankar Sharma, former Vice-Chairman of National Planning Commission of Nepal, Professor Dr. Prabir De from Research and Information System for Developing Countries, New Delhi, Professor Dr. Suchang He from Fudan University of China and Mr. Shafqat Munir, a journalist from Islamabad. Dr. Rahman pointed out that in the backdrop of global economic slowdown, most of the South Asian countries have shown strong resilience and have in fact thrived significantly. While funding from the Western economies has been on the decline for quite some time, China has come forward as a reliable development partner for countries in South Asia. India as well opened lines of credit for smaller South Asian countries including Bangladesh. In this context, the Belt and Road Initiative (BRI) led by China intends to link 65 countries and 4.4 billion people in Asia, East Africa, Middle East and Europe. South Asian economies can certainly tap this great opportunity and build further on their recent macroeconomic achievements, he added. China, of course, will have to further open up to create market for the export products from South Asia. He acknowledged that there are some political concerns which need to be resolved through prudent diplomatic moves. The Indo-Pak disputes over Kashmir, and the Rohingya crisis at the borders between Bangladesh and Myanmar are examples of such political hurdlers. “But we are optimistic that eventually the ‘political concerns’ will be overwhelmed by ‘economic benefits’” said Dr. Rahman. In fact, he added that a “win-win cooperation” for all is quite possible as there already exists economic involvement of China with all of the South Asian countries. For example, each year goods worth USD 70 billion pass between India and China. China is the largest trading partner of India, Bangladesh and Pakistan, and the second largest trading partner of Sri Lanka and Nepal. Dr. Rahman emphasized on importance of bringing all stakeholders in confidence when implementing mega inter-country projects such as those being proposed under OBOR. He opined that India has set a good example of taking local sentiments on board when implementing connectivity projects such as the BBIN-MVA. Strong political will coupled with prudent diplomacy will enable South Asian countries to achieve the maximum benefits of connectivity initiatives between India, Bangladesh, Myanmar, China and most other ASEAN countries. Here the generous diplomatic leadership of two Asian giants India and China will have to be forthcoming. The ongoing Rohingya crisis should, therefore, be quickly resolved with support from both these two large Asian countries for realizing the benefits of desired regional and sub-regional cooperation. Professor Suchang He elaborated on the Chinese BRT Initiative terming it to be multilateral promoting open economy, common security and shared prosperity. Dr. Rahman concluded the session with a call for the Asian Countries to come together to realize the dream of common prosperity for all the people of Asia. Even the smaller economies of South Asia can contribute hugely to this end if they can remain together, he further opined.